Below is a list of some fine gourd crafting and related books available for purchase. Here you will find great books for learning about growing, crafting, and enjoying gourds, as well as pattern ideas and inspirations. Buying books online is easy, and items can be purchased with a credit card. Amazon.com offers an extensive selection and great prices, including books both new and used. Free shipping is usually available with a $25 purchase, and other discounts are often available. *Please note that this is a separate transaction from other materials purchased from Arizona Gourds. Gourds make the perfect three-dimensional canvas. With their varied sizes and shapes, they’re nature’s gift to the crafter, who can use a multitude of techniques to transform them into breathtaking pieces. Cut them, carve them, paint them, inlay them with stone, or embellish them with leather, fur, feathers, and botanicals: the magnificent possibilities are all featured in this splendid guide, which covers all the gourd crafting basics. Find out how to choose the right gourd (or grow your own); what safety procedures to follow; how to clean, cut, and smooth the gourd; and which tools and decorative materials to use. The projects range from a native rattle and gourd mask to a faux basketry vessel and nested vases and bowls. 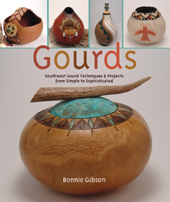 This book features gourds from 25 top gourd artisans, fully illustrated with step by step information about their techniques and a project. Jennifer Avery, Latana Bernier, Rosalind Bonsett, Carla Bratt, Barbara Carpenter, Jenni Christiansen, Lisa Conner, Emily Dillard, Debora Easley, Bonnie Gibson, Geri Gittings, Gourd Artist's Guild, Barbara Holman, Cindy Lee, Melynda Lotven, Anne McGillivray, Jan Meng, Mira Mickler Moss, LInda & Opie O'Brien, Dyan Mai Peterson, Colleen Platt, and Kitty Riordan. Foreward by Dave Sisk. Visit these Links for More Gourd Related Books! A new pyrography design book from a master of the art - Sue Walters. Versatility is the main attraction of this manual that offers 30 handsome wildlife illustrations and 10 border designs suitable for transfer. Information is included about techniques for transferring both line and tonal patterns, illustrations are marked to show how to isolate parts of the design to use in conjunction with other images or alone, and the use of computers and copiers to modify patterns is also discussed. Although created for pyrography projects, the patterns are suitable for engraving, lino cuts, quilting, relief carving, stained glass, stencils, and tole painting—with color photos of finished pieces in all of the formats gathered in a gallery at the end of the book. *Note: "Beyond the Basics" has been re-released in a paperback edition. This book has the same content as the hardback edition, but does have a new cover.